Remember when I was all, “I am conceited confident, but I’m not perfect, sometimes I still call myself a girl when I want to be considered a woman“? Approximately four hours later, I proved ALL of those things with one sentence. Last night, I walked into my apartment gym and as I was getting on the last open treadmill, the guy next to me started to get off his. 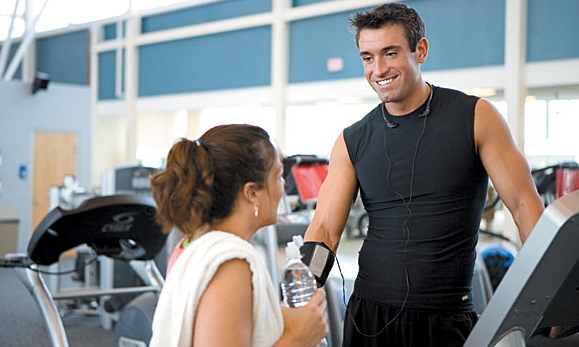 Talking to people at the gym – especially the small apartment gym – is awkward, but I had something to say, so I politely waited until he disconnected his earbuds from the TV on the tread. Little bit of column A, little bit of column C. Oops. Not so much B because his time killed mine, but hey, I’m running through an injury here! I’ve always thought that my cuteness interferes with people hearing my message (well, always after I heard that quote on HIMYM), but perhaps my abrasive, ball busting way of flirting interferes with men seeing my cuteness? Ah, clarity. I’m certain I’ve read this article many times in many incarnations in the pages of Seventeen, Teen and Cosmo Girl many years ago. I’m sure my current literature of choice – Marie Claire, Cosmo and Glamour – have touched on this topic occasionally as well, although for the most part, they seem to advocate trolling bars/Starbucks/your boss’s office for herpes men. I’ve always been so enchanted when I’ve been asked out straight away, even more so if it becomes a relationship. It’s so romantic and serendipitous. I’m a big fan of fate, but I’m also a big fan of success and so far, this whole destiny thing has not worked out in my favor, so perhaps it’s time to go back to basics. And to Barnes & Noble to hide in a corner reading magazines meant for high school freshmen to remember how to do so. I’m not even sure that this guy (let’s call him Rebel) counts as a friend, because we don’t hang out. We used to work together and chatted between running food and fake-smiling at assholes guests. I kinda started flirting with Rebel the moment I met him, but he didn’t try to get in my pants at that same moment – I’ve actually known this respectful man for about three months now with no attempts – so I think that puts him in the friend zone. Not the Friend Zone, mind you. That one’s permanent. The friend zone, on the other hand, is more of a waiting space, a sorting area, if you will. Eventually, Rebel picked up what I was dropping down and started flirting back. He’s the man who sent me flowers – yes, without so much as a precursory date…this one does it right! We’ve been taking turns attempting to make plans even though our schedules hate each other. I guess the point is that we keep trying. We like each other and once we put that out there, our walls kind of came down. It’s fun to flirt a little and change how we talk to each other, tiptoeing out of the friend zone in a cute and innocent way. And I’m reminded that it is still fate to have someone come into your life and become someone special, regardless of the amount of time it takes to get there. Eventually we may try the transition thing (although for now, my new attitude about dating is telling me to have fun and take it one step at a time). For tonight, we’re trying the date thing!